City workers plan to remove the spray paint from the rock, while police plan to charge the suspect with vandalism. If it ends up costing $1,000 or more to clean up the rock, the suspect would face a felony charge. If the cleanup costs less than $1,000, the suspect would face a misdemeanor. Authorities have yet to identify a suspect. Investigators are asking anyone who knows the identity of the suspect to call the police department at (805) 781-7317. OKG! They haven’t caught this guy yet! He might paint a grapefruit or a Casaba melon next…..and young people certainly don’t need to exposed to that sort of thing. Spare no expense! Hunt this guy down and stop him before he can paint another fruit. We can’t sleep in our own beds knowing this guy is still out there. Don’t call it a man hunt. It looks like something a woman would do. What ever effort or cost the police are going to investigate this, its a waste of resources. This crime is way too petty. Instead of looking foe who done it, we should be signing a petition to repaint the rock with “official city paint”. but to find out what “official city paint” is the city will have to spend $10,000 or more on consultants, people claiming to be experts in paint, likely turning out to be “special” friends or family members, and countless votes and maybe in 1 to 2 years we would have a finding. Yes, I much prefer the graffiti on bridges, buildings, street signs, etc. I liked the watermelon and one could consider it temporary, the paint wouldn’t have lasted a year, public art. And for free, unlike the almost universally reviled monstrosity of a of a sculpture on Monterey at the north entrance to town. T And to conduct an “ongoing police investigation” at a cost many times more than a thousand dollars that need not have been spent? Where are the ongoing investigations of the aforementioned graffiti? If you were a property owner wanting an ongoing investigation of graffiti you would be laughable. The downtown is a public sewer for the drunken college kids and the homeless and Bubblegum Alley is advertised as a tourist attraction. How about “visit SLO, hike the beautiful Bishop’s Peak Trail, enjoy the views, see whimsical watermelon rock”. And bring back the “P” on the northeast cliff facing the campus! If left to city workers, with their city salaries and their city work ethic it is certain to cost over $1,000, if they let a private sector company do it it would cost less than $250 and be a better job. Geniuses at work. 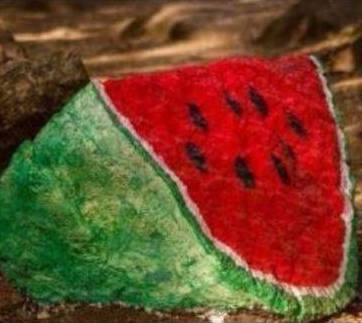 Come to SLO and visit the world famous “MWR: Mysterious Watermelon Rock”. Unlike gumball alley, the MWR does not smell like piss. Ka-ching. The thing to me is, it wasn’t the vandals rock to paint. The vandal made the decision to claim domain over it, and decided to impose his/her artwork upon us all. Selfish.